Focused on the Magic Bloghop ~ A Wild Ride! 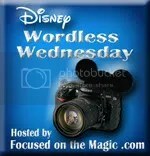 This week’s theme is Disney Parks Wild Side. Deb from FocusedonTheMagic.com mentioned wild rides are included – so my thoughts immediately went to this photo. Yep – that’s me – backseat left. Glamour shot right? I can’t look at this photo without cracking up laughing. I hope you have the same reaction! I hadn’t been on Rock ‘n’ Roller Coaster® Starring Aerosmith in quite some time. Perhaps it was the promise of my friend Ramon to sit next to me since I was afraid – or the sheer joy and anticipation in this little girl’s face while we were in line – but something inside me said I needed to take this thing on again – and quit being such a wimp. This photo was taken at the very beginning of the ride, during the high-speed launch that goes from 0 to 60 mph in 2.8 seconds. After that – it was actually VERY fun for me!! I love the music of Aerosmith so hearing the tunes while enjoying the ride was an added bonus! In fact, I can’t wait to go on Rock ‘n’ Roller Coaster® Starring Aerosmith again! Do YOU have any photos of yourself and your family enjoying the “wild” rides at Disney? Please send them to me at Disneyways@Disneyways.com and we will post them here on the blog!